Obituary – Morrison, Helen Lucille (Keyser) « Perry High School Alumni Association, Inc.
– daughter of Mr. and Mrs. George Keyser, route 1, Perry, was born July 10, 1925 at Perry. She had attended grade school at 4-D and Fremont, district 34. Helen plans to attend summer school at Central State college at Edmond. 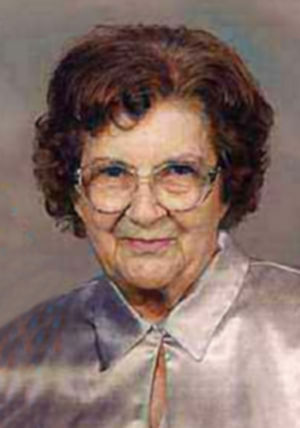 Helen L. Morrison, 84, of Perry, Oklahoma, went to be with her Lord and Savior. Memorial services will be 2:00 p.m. Saturday, March 20, 2010 at the First United Methodist Church in Perry. Rev. Ed Cook will officiate. Inurnment will be in Grace Hill Cemetery. Services are under the direction of BrownDugger Funeral Home. Memorials may be made to the Soup Kitchen in care of BrownDugger Funeral Home, 1010 N. 7th Street, Perry, Oklahoma 73077. Helen was born on July 10, 1925 in Perry, Oklahoma to George B. and Lottie Acers Keyser and died on Saturday, March 6, 2010. She and John Morrison were married on March 27, 1953 in Wichita, Kansas. Helen graduated from Central State College. She was an elementary teacher for twenty years in Oklahoma and Kansas. She enjoyed teaching piano which she taught for over thirty-five years. She was a member of the First United Methodist Church in Perry and enjoyed volunteering at the Soup Kitchen. Helen is survived by one son, John W. Morrison, Jr. and his wife, Kathy, of Marshall, Oklahoma one daughter, Kathleen Lucille Christine and her husband, Doug, of Carbondale, Colorado, four grandchildren and eight great grandchildren. She was preceded in death by her parents and brother, Perry Irving Keyser.